Often referred to as the "workhorse of the rivers," grab unloaders use a clamshell bucket suspended by a set of hoisting cables, while a separate set of control cables opens and closes the bucket. In a complete unloading cycle, a bucket unloads a barge at a rate of once every 30-40 seconds. A moderately-sized grab bucket unloader has a maximum unloading rate, also known as free digging rate, of 1500 tons per hour. This rate decreases considerably as the barge is emptied. At that time, less bulk material is available in the barge, so the bucket takes longer to fill. The grab unloader is traditionally a stationary machine, but it can be engineered to travel short distances along tracks that run parallel to a river, for simple left-to-right movement. 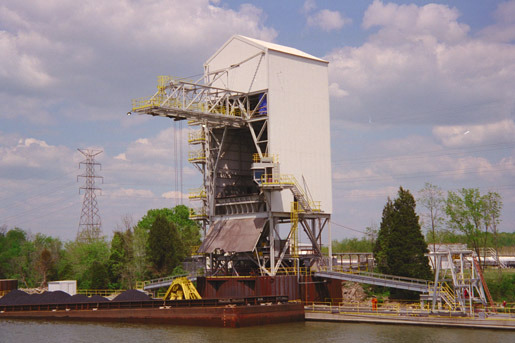 The unloader features a control tower that straddles the dock conveyer and supports the receiving hopper. An attached cantilevered boom carries the grab bucket trolley and cable systems. While the machine is operating, it works in a continuous cycle of hoist-travel-discharge-travel-lower motion. The distance the bucket travels will vary as it unloads material from the full width of the barge. In order to unload material from the full length of the barge, the barge is positioned by a barge haul system. For grab bucket unloaders, barge hauls are a simple tugging motion to keep the barge parallel and flush with the dock. 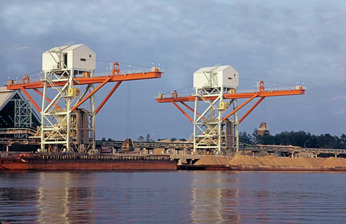 This system consists of a steel cable and hoist that is directly connected to the barge itself. Since the barge's movement is intermittent, its position does not need to be exact. Barges are usually positioned in and out of the unloading area by tugboat.